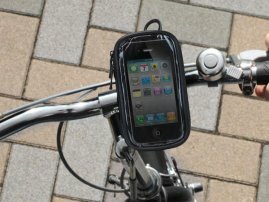 Universal Waterproof Bike Mounts For iPhone / Cell Phones : allputer.com - Accessories for all your Portable Electronics & Computers! TUNEMOUNT Bicycle mount for Smartphone allows iPhone 4, Xperia, GALAXY S, IS03 and other smartphones to be easily attached to a bicycle's handlebars. It includes a waterproof zipper case for smartphones, a mount for bicycle handlebars and a clip for attaching to and carrying the protective case when not cycling. Simply place iPhone 4 or other smartphones into the zipper case and then attach it to the bicycle mount. The mount includes a strap mechanism which is adjustable in length and fastens tightly to handlebars. When not in use on a bicycle, remove the zipper case from the mount and slide on the included clip. The clip can attach to a belt or pocket so your smartphone can stay by your side and remain inside the protective case at all times. The front window of the zipper case is clear and allows for touch operations of smartphone screens. It is great for use with GPS navigation applications and location tracker applications developed for cyclists. The zipper case keeps out moisture and can fit smartphones of maximum size 65(W) x 123(H) x 15(D)mm. The mount has a ball joint which is freely adjustable to find the best screen viewing angle. It rotates both horizontally and vertically. TUNEMOUNT Bicycle mount for Smartphone is compatible with handlebars of between 20mm and 38mm in diameter so will fit most standard bicycle handlebars and even baby strollers.